Thermal Wristbands, come in sizes: 10" x 1" They are single use bands, they are waterproof and offered in fan folded stacks of 1,000. They are available in a range of Neon or Solid colors. 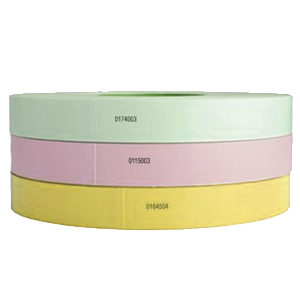 This band function appropriately in Practical Automation and Boca band thermal printers. The adhesive used is designed for maximum strength and non-transferability. The die cut model ensures shredding of band if tampered with. Your printer will automatically number these to offer you with the facility to monitor admission crowd and audit control. The Thermal bands function makes it easy to customize your own. It can be Used for all applications through which the visual means of identification will be needed, our custom thermal bracelets may be an attractive, comfortable and durable option.